A press release for the Greenville Times Examiner, Greenville, SC. 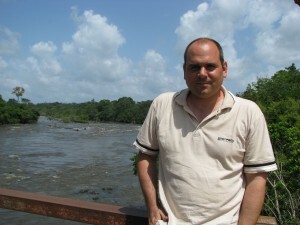 Missionary David DiCanio stands on a bridge overlooking the St. Paul River in Liberia, shortly before being evacuated from the country because of the rapid spread of the deadly Ebola virus sweeping the West African region. GREENVILLE – A local missionary returned to Greenville early last month to speak to his home church congregation about his work in Liberia, West Africa. David DiCanio, a graduate of Geneva Reformed Seminary on Haywood Road, was forced to leave his mission station in Liberia because of the spread of the deadly Ebola virus. After spending 21-days in a self-imposed quarantine, the maximum suggested by the World Health Organization, DiCanio began a six-month speaking tour among churches in the Free Presbyterian Church of North America (FPCNA) denomination. Speaking at Faith Free Presbyterian Church on Haywood Road in early September, DiCanio said that he and his colleague Joanne Greer, a Free Presbyterian missionary from the UK, were able to catch the last British Airways flight out of the country, as additional western airlines suspended service to that region. Both DiCanio and Greer were alarmed when a woman seated near them on the airplane collapsed. Greer, a trained nurse, aided the woman as she lay in the rear galley of the plane. DiCanio said passengers were asked to wait once the plane landed so that paramedics could remove the woman. “We never heard whether this woman had Ebola, but passengers were very concerned,” DiCanio said. British Airways gave Greer a free round trip ticket as an expression of thanks for her bravery. 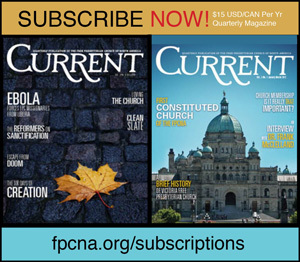 The FPCNA has three mission churches outside Monrovia, the capital city of Liberia, and both missionaries are maintaining daily contact through Skype. The FPCNA has set up a charity fund to help with both medical and food needs. The instability in Liberia has forced the missionaries to send church members to a more reliable but higher priced American clinic outside Monrovia. The missionaries are also coordinating the distribution of rice and beans to their congregations, a necessity because of the rise in food prices. Several people in one of the missionaries’ congregations were quarantined after a member died from the Ebola virus at the local government hospital where she worked as a midwife. Church members suspect she came into contact with the virus while delivering a baby from an Ebola patient. When the pregnant woman and several of her family members died, the church members became concerned when they saw their fellow parishioner become ill. Within the week she too was dead, but not before the members, with their pastor, visited her at her home. This visit has the missionaries concerned that others may also become infected. Both missionaries expressed concern for the spiritual needs of the people because several Liberian preachers were saying that the virus was a judgment from God. “According to the Bible, God does indeed judge nations,” DiCanio said. “But we can’t say if this is a direct judgment for particular national sins. Preachers need to be sure to point people to Christ as the only hope for deliverance from the great Day of Judgment for sin—sin which all men have,” DiCanio said. Miss Greer expressed concern that the people in Liberia would remember that God is sovereign in all things, and that He controls all things for His own glory. “God has a purpose in this, and He is still on the throne of heaven,” Greer said. Neither of the missionaries knows when they will return to the field because the virus continues to spread. British Airways have cancelled their return tickets, and they were told not to expect service to resume to West Africa until later in 2015.